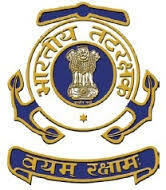 Indian Coast Guard Navik (Domestic Branch) has published a Advertisement for below mentioned Posts 2015. Check below for more details. Educational Qualification : 10th Class with 50% marks in aggregate from a board of Education recognized by Central / State Government. Height: Minimum height 157 cms. Reduction in height for candidates from hilly areas and tribal areas will be in accordance with the Central Govt, orders. Weight: Proportionate to height and age ±_10% acceptable. No Cardio-vascular disease, surgical deformities like knock knee, flat feet etc. infection of ears, no history of fits or psychiatric aiplment, varicose vein, corrective surgery for eye sight etc. How to Apply : Interested candidates may apply on prescribed application form along with copies (not returnable) of 10th class marks sheet and pass certificates, caste certificate ( SC, ST, OBC as per Govt. of India format), Age Proof, Domicile, Sports certificate attested by Gazetted Officer, one recent passport size colour photograph (Not older than one month) and a self-addressed (unstamped) envelop of size 22x10 cms are to be attached with the application & send by ordinary post only to given below address. All enclosures must be stapled / tagged with the application. Address to sent Applications : The Recruitment Officer, C/o Coast, Guard Region, (NW), Post Box No. - 09, Sector -11, Gandhi Nagar, Gujarat -382 010. (For Noida, Kolkata, Mumbai & Chennai address view official notification).